Description: In 1990 Fisher-Price joined forces with S.C. Johnson manufacturers to make the Fisher-Price Bathcare line. This line includes a variety of different baby bath accessories (shampoo, conditioner, lotion, etc.) that are high quality, Tear-Free, and made of mother-tested ingredients. Five different Bathcare accessories were introduced in 1991. These accessories were sold in tall bottles with round Little People heads. To use the product, simply pull the head upward and the contents squirt out of the top of the head when the bottle is tipped and squeezed. When the products are all gone, children can use the bottles as a bath toys to fill with water and squirt. In 1992 four new products were added to the line, but oddly only one of them was sold in a bottle with a Little People head. The rest of them were just common containers with a picture of a Little People head on the front label. Somehow the picture hardly takes the place of the cute Little People head and needless to say, the line died soon after. FPT19888 - Baby Shampoo - Tall clear bottle (12 oz.) with yellow shampoo inside, a round Little People head on top, and a yellow and white striped paper lithograph around the front of the bottle. The lithograph is marked "Fisher-Price" at the top in blue (red heart shape between "Fisher" and "Price"), marked "Baby Shampoo" in blue in the center, and "Tear Free" in red. ©1989 Fisher-Price. Approx 8.5" tall. FPT19889 - Gentle Conditioner - Tall pink bottle (12 oz.) with a round Little People head on top with yellow molded plastic hair, and a pink and white striped paper lithograph around the front of the bottle. The lithograph is marked "Fisher-Price" at the top in blue (red heart shape between "Fisher" and "Price"), marked "Gentle Conditioner" in blue in the center, and "Tear Free" in red. ©1989 Fisher-Price. Approx 8.5" tall. FPT19990 - Baby Lotion - Pink bottle (9 oz.) with a round Little People head on top and a pink and white striped paper lithograph around the front of the bottle. 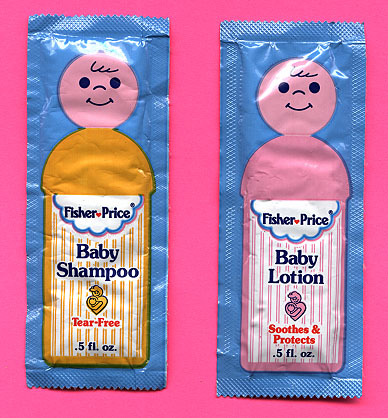 The lithograph is marked "Fisher-Price" at the top in blue (red heart shape between "Fisher" and "Price"), marked "Baby Lotion" in blue in the center, and "Soothes & Protects" in red. ©1989 Fisher-Price. Approx 7" tall. FPT19991 - Baby Bath - White bottle (9 oz.) with a round Little People head on top and a blue and white striped paper lithograph around the front of the bottle. The lithograph is marked "Fisher-Price" at the top in blue (red heart shape between "Fisher" and "Price"), marked "Baby Bath" in blue in the center, and "Tear-Free" in red. ©1989 Fisher-Price. Approx 7" tall. FPT19994 - Aloe Enriched Baby Bath - White bottle (9 oz.) with a round Little People head on top and a aqua and white striped paper lithograph around the front of the bottle. The lithograph is marked "Fisher-Price" at the top in blue (red heart shape between "Fisher" and "Price"), marked "Aloe Enriched Baby Bath" in blue in the center, and "Tear-Free" in red. ©1991 Fisher-Price. Approx 7" tall. FPT19995 - Wet 'n Dry Detangler - Tall thin white bottle (8 oz.) with a squirt pump on the top. The bottle has a pink and white striped paper lithograph around the front of the bottle. The lithograph is marked "Fisher-Price" at the top in blue (red heart shape between "Fisher" and "Price"), marked "Wet 'n Dry Detangler" in blue in the center, a picture of a Little People figure's head, and "99% Oil Free" in red. ©1991 Fisher-Price. FPT19996 - AntiBacterial Soap - Short round clear plastic bottle (8 oz.) with red liquid soap inside and a white pump on top. The bottle has a pink and white striped paper lithograph around the front of the bottle. The lithograph is marked "Fisher-Price" at the top in blue (red heart shape between "Fisher" and "Price"), marked "Children's AntiBacterial Soap" in blue in the center, a picture of a Little People figure's head, and "Extra Mild" in red. ©1991 Fisher-Price. FPT19997 - AntiBacterial Soap Refill - Tall round clear plastic bottle (15 oz.) with red liquid soap inside and a white flip-up lid on top. The bottle has a pink and white striped paper lithograph around the front of the bottle. The lithograph is marked "Fisher-Price" at the top in blue (red heart shape between "Fisher" and "Price"), marked "Children's AntiBacterial Soap" in blue in the center, a picture of a Little People figure's head, and "Extra Mild" in red. ©1991 Fisher-Price.